The Coffee Collective Blog: God Luck Ramsus ! 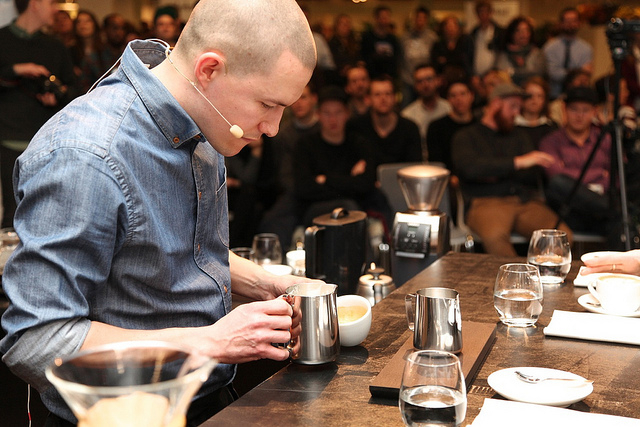 On Friday the 17th our very own Rasmus Gamrath, this year’s danish barista champion, left for Melbourne to participate in the world barista championship – WBC. He will be competing with our new crop Kenyan coffee from Kieni in a very personal and less is more´ set, which really showcases his daily work and service abilities. Hopefully this will set him apart from the other competitors and give him a chance to go far in the competition – We are all cheering for him. In connection with the WBC, from 22nd to the 26th of May, we will be streaming the competition in our bars. So, come down for a cup and get to know more about the competitive side of coffee.